This book touches on almost everything you need to know about practicing and understanding what it takes to be an expert at something. Generally, the point of this book (and really this whole blog) is that we know much more about how to learn than most people think we do. I’ve spent much of my music education wondering if I am practicing the best way and if I am good enough to succeed. This book answers those questions for you. It tells you what the best way to succeed is. It tells you, also, that you absolutely have the “talent” and potential to succeed because you have the limitless power of a human brain. But, you can put in time without results and you can do the correct exercises the wrong way if you are not mentally invested and approaching you practice and learning deliberately. But we have the science now. Just like we know more about everything from reeds to medicine to physics, we know more about learning so we don’t have to guess. Knowing how to learn and deliberately practice is as much a necessary part of our technique as knowing how to tongue or bow correctly, how to voice and resonate, how to fix intonation, or any other skill we develop for our craft. There are a couple major take-homes I think we should all have though. That all expertise is the result of incredibly hard and consistent correctly done work in combination with opportunity and resources. It is not, however, the result of innate talent. There is a best way to learn and it is something we all have the ability to do. If you want to be the best in your field at something, you need to use “deliberate” practice to get there. The book and this post go into more detail, but the key is that we all have access to this, but don’t all use it. There is a difference between the skills of figuring out how to improve on your own and knowing how to learn from others. In today’s world, I think the second is more valuable. Let me explain. For musicians this is the difference between someone who “naturally” can figure out how to improve technique on their instrument (find the right embouchure, hand position, voicing, etc without too much help) and someone who can grasp these concepts and technique through instruction. As long as you are working hard to build what Ericsson calls “mental representations,” and to understand the concepts behind good technique and musical ability enough to build upon them, you don’t have to have the skill of knowing how to improve on an instrument at birth. This means it does not matter if you can solve technique problems on your own, especially in the first decade of learning your instrument. It just matters if you are willing and able to use the resources and knowledge of others who have already figured out those answers. Because as Ericsson argues, the skill of learning (in conjunction with work and resources) will give you the ability to creatively push the limits of your field. You don’t need to be able to invent the wheel, you just have to be able to understand it and use it. So what is the best way to learn? If you plan to read the book, you can stop here and get started (or keep going if you like spoilers, after all, this is science, not a suspense-thriller)! This is a companion guide for as you read as much as a summary. If you are pressed for time, though, this is a good overview of what this book tells us about the learning model so you can benefit from it until you have time to go more in depth. There are two things you should take from this book . 1) There is a best way to learn long term and it is a process you should cultivate every time you practice/learn. 2) Every aspect of mastering your instrument is learnable, and complex skills like this can be broken into steps for you to manage. We should always be practicing with a specific goal in mind (knowing what correct looks like, while evaluating whether we are there). The goal might be to improve sound quality, fix pitch, increase tongue speed, phrase a certain way etc. This is called purposeful practice. This might be knowing what all the correct rhythms, fingerings, and pitches sound like. Or deciding precisely what phrasing expresses your musical idea. Or having a beautiful tone despite range or dynamic challenges. For the advanced musician it might involve all of those and more. “Correct” is whatever your ideal performance would be or sound like. Often, as we improve, our idea of “correct,” will be more and more complex, adding in subtleties of great performers. But you have to know what “correct” is before you can attempt to reach it. So, generally, we need to decide what “correct” is, see where we are in relation to that, determine the causes of our shortcomings, and choose appropriate solutions. That is sometimes simple and sometimes not. And you have to practice using the model the same way you have to practice each individual step. Take this with you into the practice and experiment with putting it to use every time you work a skill or passage. The important thing this book points out, is that every aspect of this is learnable. You can learn to give yourself and benefit from accurate feedback, you can learn how to identify underlying causes of problems, you can learn what is causing those problems, and you can learn how to fix them. That’s a lot of learning, but that’s why it takes so much work. It’s also why performers in all fields are continually pushing the boundaries of what we think is possible. We are getting better at learning. These make the most sense in conjunction with the book. I break it into general chapter sections, but all the information overlaps so feel free to skip around and refer back to sections however you like. One of the things I love most about this book is the overwhelmingly positive and optimistic tone and message Ericsson conveys. Yes, we are in for an incredibly long (really a never-ending) journey to maintain our expertise. But, most importantly, if that is our goal, we all have the mental resources to succeed. There are a million factors that will affect whether you “succeed” in a given field, but your innate ability to learn is not one of them–you definitely have it. And I cannot imagine a better gift in life than the amazing potential of our human brains. There is something we all have to face as learners in any field. Putting in time is not enough. You have to do it correctly. We all know sitting in ensemble classes in high school did not make us better the way practicing on our own does and this is the reason why. In a lot of ways, this chapter pointed out some very obvious things about the world that we seem to take for granted. It also was something I never considered. The world does not have that many experts and it is perfectly acceptable to not be an expert at something. In most aspects of life, we just have to reach competency. We cook well enough to eat, clean well enough to live hygienically and comfortably, swim well enough to not drown, drive well enough to not crash, etc. We don’t have to be (or really want to be) the best chef, cleaner, swimmer, or driver we know to succeed in life. We also don’t have to be the best musicians. But if that is our goal, we have to approach our instruments with an entirely different mindset than one of just putting in the time. Our journey with our instruments will be vastly different from our journey with basically everything else in our lives. We will have all the aspects Ericsson describes: being out of our comfort zone, making short and long term goals, and practicing with focus, strategy, consistency, and deliberation. Did you practice the way you studied for school? Our journey with our instruments will be vastly different from our journey with basically everything else in our lives. The only reason for that, though, is because we are not usually trying to be experts at those other things. But the learning process is the same. I know some people who were better at music than academics, some the opposite. I didn’t realize that when I was younger, I studied to learn, but I practiced to practice. Really though, the process is exactly the same, and if we had the desire and opportunity to put in the time correctly, we could all succeed at whichever subject we chose. When I studied for a class I was learning concepts. When I practiced my instrument, I was practicing performance–I wasn’t learning. That is, I was giving myself chances to try a section and play it a certain way. But I wasn’t always learning how to do it correctly, I was basically just hoping that through will-power and effort it would work. For example, I would try to play a high note entrance softly and beautifully in a lyrical phrase (mildly tough on many instruments for beginners). I would do it over and over trying to get better (this is purposeful practice, so there are certainly worse strategies). I even did voicing exercises this way. I did them over and over trying to repeat successes more than failures in the exercises sounding the way I wanted. But I didn’t create a real strategy for making that happen more than just “practicing” or giving myself another try. What was making me succeed and what wasn’t? How can I succeed every time? If you aren’t working to answer these questions, I don’t think you are really learning. I think most of my negative educational or learning experiences (in school, work, and life) have come from lack of feedback. You need feedback first about whether or not something is working, and secondly feedback about why and why not, and thirdly about how to change it. And the feedback needs to come immediately. Some negative experiences have been from being told something is incorrect without feedback about specifically what is incorrect. Others have been from hearing that something is wrong, but not in conjunction with any strategy for fixing it. Sometimes a combination. This is something we need to be aware of as students and as teachers. In the learning process, having feedback that people can understand and use specifically is invaluable and absolutely necessary. It can be stagnating, counterproductive, and even terrifying to travel without a map or compass and sometimes practicing without feedback makes us wander through our improvement process in exactly that way. We will see more about feedback later, but keep this in mind. What are the mental representations we use? I am curious to discuss this with other musicians. It seems to me have mental representations of how to play our instrument as well as how to be good musicians and that they are perhaps slightly distinct. We have mental representations of good sound, correct technique for the many aspects of our instrument, long tones, scales, and more. We would have concepts of how they should sound and how we actually perform them. I think we also have mental representations of each piece we present. We would have a plan for our phrasing and musical interpretation as then a concept of how it feels to correctly implement that. But, performing a piece is a complex skill that is likely full of many mental representations and without precise studies about what they are, I am curious to see how other musicians interpret this. Feel free to leave a comment! How does this fit in with your usual practice sessions? Are you using the gold standard? Let’s talk some more about why we want to. The limit of purposeful practice is that you can correctly identify something is wrong without knowing the best strategy to fix it. Let’s think about tonguing (or a parallel for something like good bowing, resonance or head/chest voice technique). You can work purposefully on increasing your tongue speed, but doing it correctly matters much more than doing it. It’s a common exercise to practice a passage at 3 different speeds (comfortable, achievable but tough, and pushing the limits of tongue speed). The tongue is a muscle that does need training to increase speed. But there is a limit to how fast you can go through sheer effort and muscle training. You need good tonguing technique. Is just the tip of your tongue moving or is excess movement slowing you down? Are you keeping yourself from tensing? Are you using air to aid your tongue’s movement? Are you tonging on a section of the reed or mouthpiece or lip that will help you get the best sound efficiently? There are million ways to tongue that are not efficient. And you can improve your speed and quality on any of them, but only to a certain degree. Like Steve and Dario, and others who tried to memorize number strings, you can work to improve your technique, but it won’t matter (in terms of being the best) if you don’t use a great strategy in the long run. Without the right technique, you will eventually hit a wall and you likely won’t know it’s coming until you reach it. Ericsson brings up another aspect of this in the next chapter, “Principles of Deliberate Practice in Everyday Life: Getting Past Plateaus.” When we reach limits, it is not usually in our actual ability or potential, but in the potential of our technique. Yes, perhaps you are in a small plateau with tonguing speed where you need to cross-train or work on your muscle in a new way. But perhaps you need to find a way to make your tongue more efficient. As you prepare for the next chapter, I want to point out the ridiculously amazing potential this book demonstrates we have. Ericsson finished this chapter saying, “we have found no limitations to the improvements that can be made with particular types of practice…and there is no sign that this will stop” (p. 114). This applies not to those born with talent, or a lucky few genii, but to all of us! This limitless potential belongs to anyone willing to learn correctly. So let’s read more about how to do that. How do teachers fit into the learning model? One of the most positive messages from this book is that every skill we need to succeed is learnable. Over and over this shows us that your “talent” level is irrelevant. All that matters long term is that you are ready and willing to learn correctly. Because, lucky for us, we stand on the shoulders of generations of musicians and teachers who have found solutions to many technique and musical problems. They have created maps and taught others the way so that we don’t have to repave the same paths. We can build on their knowledge rather than rediscovering it in each generation. That is the idea behind good private lessons or at least individual feedback from a music teacher or advanced friend. Immediate and accurate feedback from a teacher who knows how to answer the questions raised in the steps above is the fastest way to improve. That way you can spend time improving, not trying to understand how to improve. The teacher can also train students to give that feedback to themselves as they improve on their instruments. The important thing is that the teacher needs to balance focus on knowledge and skills. In “Principles of Deliberate Practice on the Job: Knowledge Vs. Skills” (p. 131) Ericsson notes that Dario getting the knowledge about what strategy to use was very helpful, but not sufficient for success. A great teacher will give you that knowledge, and then work with you on developing the skills to implement it. You can do all of that on your own, but a good teacher will make that process much more efficient (and hopefully less stressful) so that you can improve more quickly and happily. What does this mean for masterclasses? In “Principles of Deliberate Practice on the Job: A Knew Approach To Training,” Ericsson points out that training programs are not successful for doctors because they do not get accurate feedback and a chance to work on implementing knowledge and developing skills. I worry about the implications for masterclasses. I have had them at every music festival or school I have attended over the past decade, and they follow basically none of the ideals of deliberate practice (it seems like a slightly better version of watching a youtube video, even if that video is made by an expert). Like the medical conferences, it seems quite hard to reach large numbers while also allowing for personalized feedback. It seems it would require the instructor of the class to give feedback to the volunteer performer about how not just to improve on that aspect of that particular piece but how to improve on that aspect in general and apply it to any piece, as well as allowing for audience members to try it and receive some kind of feedback–which is the biggest challenge. The audience does get feedback on someone else’s performance, but they don’t get to apply the concept or the mental representation for themselves until later and they won’t get any feedback from the expert. It seems that in the best case scenario they get some knew knowledge (I don’t think that is always successful) but they will not get a chance to try the skill. I would love to hear people’s thoughts on this. Does this concern you as well? How can we make masterclasses more beneficial for everyone? I think these chapters will be especially relatable for many of us with a background in (over)achievement. I love the chapter not natural talent! (Well, I love all the chapters.) This section does a great job of breaking down how the learning process overcomes anything talent can give us at the beginning. As this book continually tells us, the underlying cause of success is willingness to pursue the learning model relentlessly–not talent. Why is it good that talent is irrelevant? Did you maybe feel stressed thinking about all the work you have to do to be an expert performer? As positive as this book it, it is very clear how difficult and never-ending the journey of an expert is. And now you can’t even rely on the talent you probably have been told you possess. My answer actually crosses over to another book, Mindset. One of the main points in the book is that thinking about or relying on talent puts you in a mindset that halts the learning process. 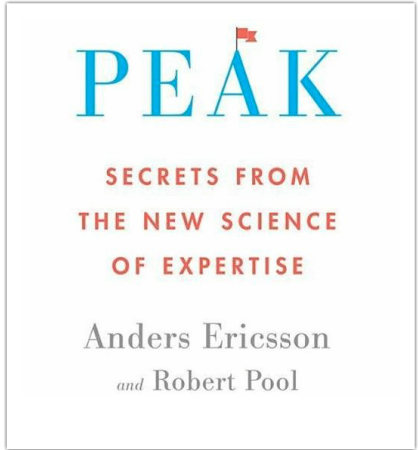 As “Peak” tells us, though, we cannot reach expert status without learning, so that is definitely not helpful. An underlying factor in that halt of learning is that relying on talent places a tremendous amount of pressure on you to succeed and to continually prove (to yourself and others) that you have talent. If you have ever struggled with the concept of talent or doubted your potential to succeed (in any area). I absolutely recommend this book (or at least my summary of it). The great thing about talent being irrelevant is that I can tell you, without ever meeting you, whether or not you have the potential to succeed. I can confidently tell you that you absolutely do have that potential. Will you succeed? None of us can know. There are a million factors–health, resources, desire, chance, etc–that will affect the outcome. But you will not fail because you lack some inherent ability. If this is the mountain you want to climb, you absolutely can do it. Just make sure you use your metaphorical map Ericsson mentioned at the beginning of this book. Well, I want to address personally. I hope this chapter and this book have encouraged you to integrate psychology into your practice (as a teacher, performer, and student) and to share this information with others. Just as we learn and practice scales and music theory, and every other aspect of our formal training, we need to understand the value and, really, the necessity of including psychological knowledge in our training. Just like someone can benefit from someone teaching them how to make reeds or resonate or buzz more efficiently, we can benefit from someone teaching us how to learn. There is a lot of information out there to sort through and, in this young field, more being gathered all the time. But rather than overwhelm us, that should be incredibly comforting. We don’t have to take the time to guess or figure it out on our own. There is always more information to discover, but we can build upon it rather than all starting from scratch. Musicians are being pushed to new artistic and creative limits. We can see that as being pushed from the comforts of traditional solo and orchestra paths of the generations before us, or we can see it as a chance to create meaningful projects with opportunities those generations did not have. Likewise, we can be overwhelmed with how much we have to work to keep up and with the amount of diverse knowledge we need (music, business, psychology, physical health, etc. ), or, we can use this information to give us new strength and artistic potential. I hope this book leaves you excited to practice and excited to see where performance fields are headed. Because every piece of data says we are going to be amazing.